Sometimes coming up with ideas for role playing world can be tough on a DM. Well not anymore! Now it can be a fun group activity with the Dawn Of Worlds rule set. This looks like a lot of fun, and can be done entirely online using forums. I think it would be a lot of fun to do a dry run of this game right here to see how things shake out. Anyone else interested? So clearly, at least some people are keen on playing. 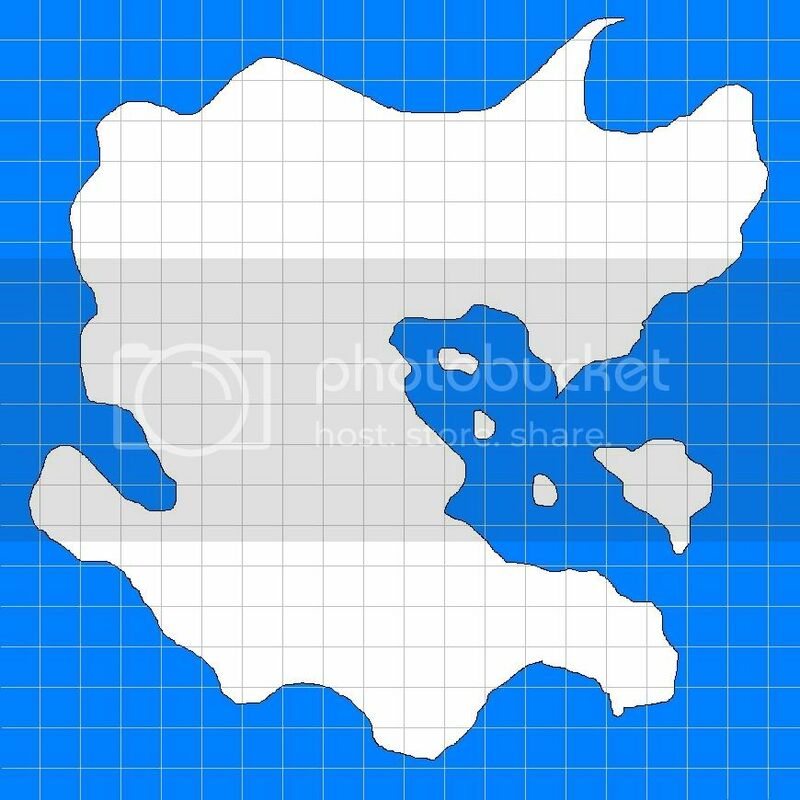 I'm getting ready to start a blank map, but I think the size of the world should depend on the number of players playing. As such, please respond if you're interested in giving this crazy system a try. Ok, I created a starting map to play with. I also created a photobucket account that the group can share. I'll PM anyone who wants to play the login information for Photobucket to upload map changes. When do you guys want to start playing? Should we wait to see if anyone else wants to join in? Nah, I think we should just get started. I mentioned it to Steve on the phone last night and he seemed content to lurk. And it seems unlikely that Brian will be stopping by regularly enough for this. I think if anyone wants to pop in later then we should just let them join in - there's not really a good reason not to add people as they come, they just won't have had as big an effect on the world. Also, I propose that each "turn" be a posted reply to your original post with the map, and each person reply with the number of points they rolled, what they want to do, the cost, and their current point total. Action: Spend all 9 points to do Shape Land 1" and turn the island on the right into a jungle island. Which, according to the rules leaves me with +1 point for next round. Action: spend 3 points on shape land to create a desert in the southern central area of the main continent. Shape Land 1" X 3 - Create mountain range in north west section of the map. Action: Shape Land, 3 Squares, from the tip of Cuzzo's mountains down to the sea I'll create a river. +2 points for second turn in a row with less than 5 points remaining. Shape Land 1" X 2 - Continuing the mountain range. Action: 2 x shape land Added two squares of mountains north of the desert. Shape Land 1" X 2 - Finishing the mountain range. This mountain range now cuts off the northern western part of the map, making travel from the mainland to that portion of the map difficult. Shape Land 1" - A lowlands near the center of the map forks the river, creating a large lake. 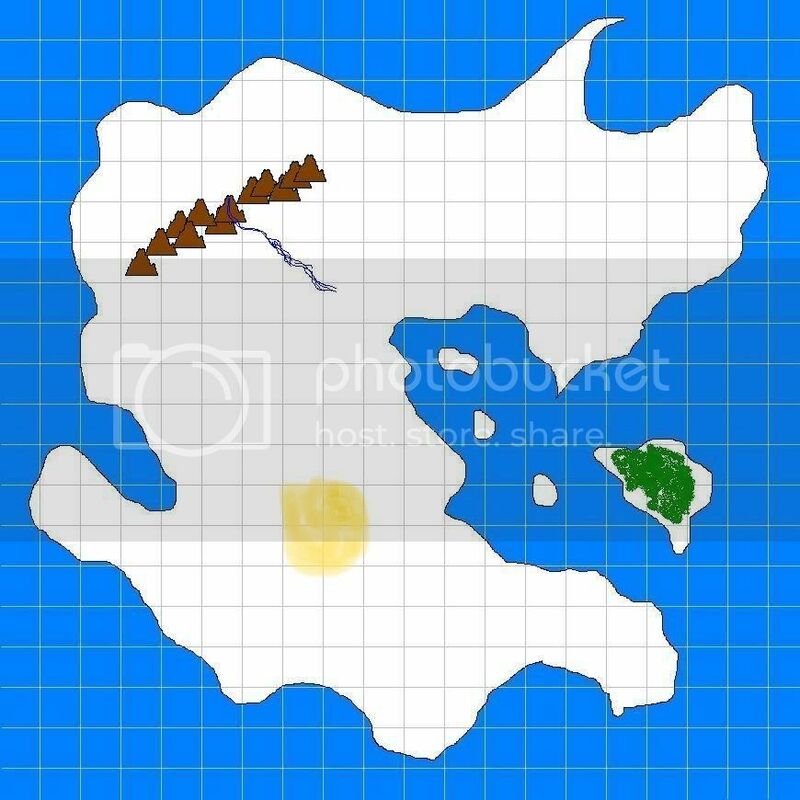 Create Avatar: 10 points - I will create a treefolk avatar named Joramund who resides in the northeastern penninsula. Action: Create Avatar - That Which Sleeps Beneath the Sands - Like the desert sands, this being is shifting and fickle. Its form varies, and often appears between a humaniod and a desert animal (I'm sort of envisioning the various Egyptian deities rolled into one), and acts as both a force of creation and destruction. Not making a map change since it's not really relevant where the avatar is right now, other than in that desert. Also, voting to continue the first age. Shape Land 1" X 3 - The lake provides plenty of water for the nearby area, turning the lowlands into a valley with dense forest.